When making bread in a bread machine it is really important to measure everything out accurately, preferably using a kitchen scale. Kitchen scales are not an expensive investment, but they vary quite a bit in quality and accuracy. We have put together our best kitchen scales guide for 2018 to help you make the right purchase for your bread making needs. 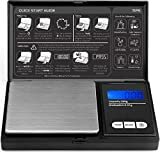 These digital kitchen scales from Accuweight have everything you need to weigh every ingredient accurately and with ease. The weight is easy to read on the large LCD display with a brightly lit red background. You can easily switch between measurements as well as measure liquid volumes in fl oz or ml. I really like the ‘Tare’ function on these scales. If you want to measure ingredients in a bowl, you simply place the bowl on the scales, press the ‘tare’ button and the scales will reset to zero. Once you have added your ingredient to measure you can then press it again to weigh some more ingredients – this is really useful for some recipes, especially cakes and batters. The sensor technology means that the scales are really accurate too. They are really easy to use, clean and the unit is so sleek it also fits in well with most modern kitchens. The automatic shut off (after 3 minutes of no use), is brilliant for preserving battery life. 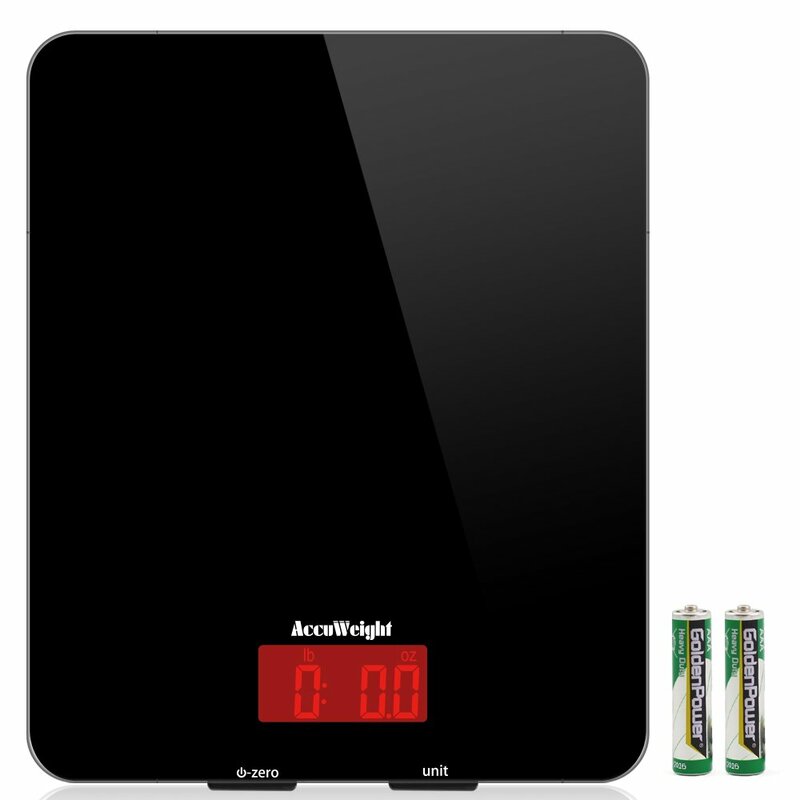 The scales run on 2 AAA batteries which are included on purchase. 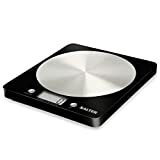 Salter are on of the most well known brands when you think about kitchen scales. 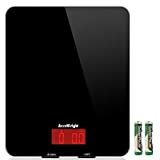 This model is very similar to the previously reviewed scales from Accuweight, sharing many of the same features. 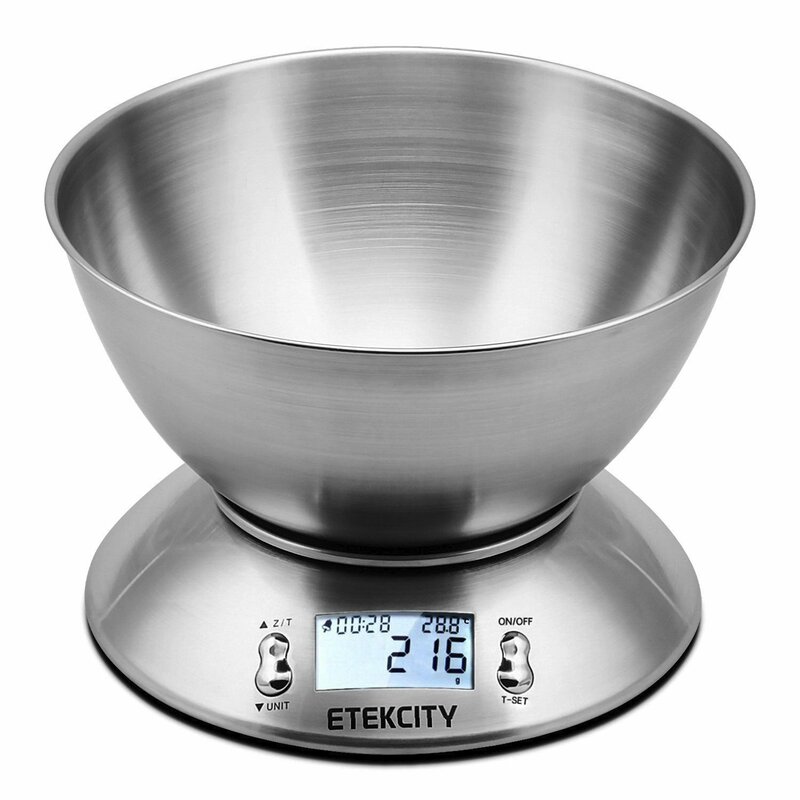 The ability to measure ingredients by adding them to a bowl and then zeroing the weight before adding another is one of my favourite features in digital scales, no more mental calculations of adding weights together! 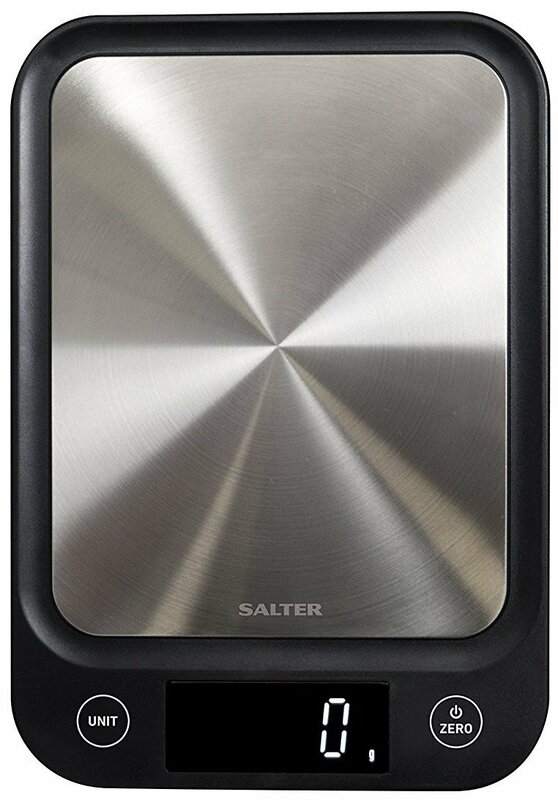 The stainless steel design of these scales make them easy to clean whilst also looking stylish. Salter show their belief and commitment to their products by offering a 15 year guarantee. 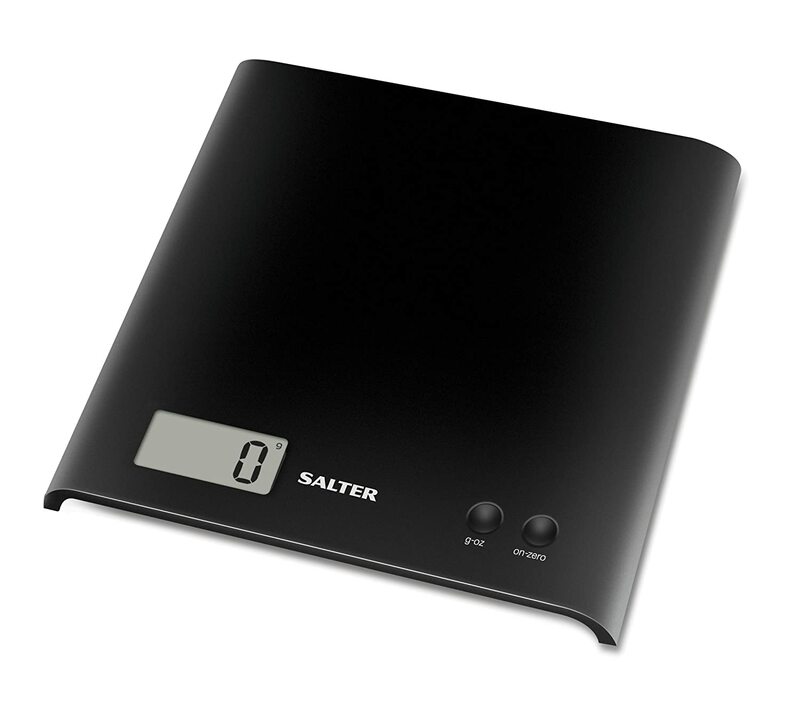 Another scale from Salter with a different design to the previous model. This one has a curved side design in a smooth plastic, available in 4 different colours (black, white, green and orange). The curved sides make it really easy to clean and it’s compact design allow for easy storage. I really love these digital scales as they combine traditional non digital scales with the more modern day models. Not only do they look really cool, they pack in a lot of features and functions. The detachable bowl makes is easier to clean as well as store if you don’t want to keep it out on your counter top. 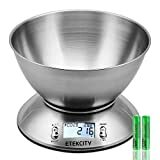 The other great thing about this function is that it means you can use interchangeable bowls and other weighing vessels on the scales to meet your needs. 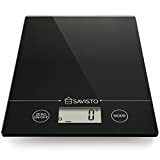 These scales share similar features as the other models discussed here, a maximum weight of 5kg, automatic shut off after 2 minutes, imperial or metric, as well as the add and weight ability. But what I really love about these scales (aside from how stylish they look!) are the two extra features. The first is a built-in-kitchen timer alarm allowing you to cut down on the need for other objects in your kitchen. The second interesting feature is the ambient temperature sensor which is essentially a room temperature display! These are a really economical option for stylish and feature packed scales. When I was growing up lunchtime meant that I would have a slab of cheese or corn beef sandwich in a couple of pieces of sliced bread which didn’t exactly leave me clock watching in anticipation for it! Nowadays lunchtimes can be so much better than just a plain sandwich or a bit of toast, as there are a number of sandwich toasters out there that you can now whip up a hot sandwich meal in no time with very little effort. You can now get sandwich toasters that are effectively 2 hot plates that you press together like Panini sandwich makers. These heat the fillings inside the 2 hot bread layers and can take thicker bread than the sealed sandwiches can. As mentioned the other popular type are the sandwich makers that you place the bread and fillings into a mould and when you close the preformed lid it seals and splits the sandwich in a couple of toasties. These are neat and tidy sandwiches, but you can fit fewer fillings in these as it needs to be able to close the lid to be able to seal the two slices together. Finally there are a few sandwich makers out there that focus on buns and crumpet type sandwiches. These tend to be for just one sandwich at a time, but some can also cook eggs as well as heating up precooked meat to give you a cooked sandwich within a few minutes. So we have a list here of what we view as being the best sandwich toasters available now. The Breville VST041 Deep Fill Sandwich Toaster has been one of the nations favorite sandwich toasters and has been designed so that it can stand upright to aid storage. It is 30cm x 26.5cm x 12.8cm in size and is made from stainless steel. The deep fill plates enable you to put your favourite fillings into your toasties and still have it ‘cut n seal’ the edges so that you don’t get any leaving out the side. It has had its design improved to give a more even toasting coverage with its internal thermostatic heating control, and with its quick and easy release hot plates is easy to clean even in a dishwasher. To aid the safety of the unit there is a cool touch handle and non slip feet to help keep it in place when you open and close the lid. There have been a few issues with the handles on some of these units in the past, but it looks like this may have been rectified as long as too much excessive force is not used to close the lid. The Breville VST041 Deep Fill Sandwich Toaster is a very popular sandwich toaster at a reasonable price providing a good sealed toastie. The VonShef 3 in 1 Sandwich/ Panini Maker is reconfigurable into either a basic sandwich maker, or a waffle iron, or even a grill! This is done via interchangeable non stick plates which are easily changed when required, and these plates are non stick and easy to clean. The brushed stainless steel casing with black ends has a integral handle and rubber feet for stability and safety. 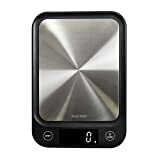 It is 35.6cm x 33.6cm x 12.4cm in size and has indicator lights showing when the unit is switched on and when the cooking time is completed. You also get a 2 year warranty with this toaster which makes for peace of mind. This is a good addition for those with space at a premium as its easy to shift from making waffles in the morning followed by a tasty toasted sandwich in the afternoon and then cooking a scrumptious dinner on the grill. However, the sandwich plates area little bit on the small side and could be deeper so you can’t get as much filling in the sandwiches as you would like. The plates are thermostatically controlled so there will be no over heating and the toaster has a locking clip on the handle for when it is not in use. This VonShef 3 in 1 Sandwich/ Panini Maker is a little small but good value for money for a student or single adult. The Breville VST025 Sandwich Press, Stainless Steel toaster is 24.5cm x 31cm x 9cm in size and a stainless steel finish. It has non slip feet with a cable tidy design and a cool to touch handle during use. Building on the innovation started in the 1970’s by Breville, the VST025 sandwich press can now let you make up to 3 paninis at once in the comfort of your own home. With it’s special hinging system it is able to toast different thicknesses of bread and also features a locking system to keep the lid in the correct position. The easy clean plates are heated to the correct temperature and a indicator lightshows you when it is ready to cook. There is also another indicator light that shows you when it is switched on to avoid any accidents. The flat plates can cause some fillings like cheese to run out of the sandwich but this is only a minor irritant for this fabulous sandwich maker. The Breville VST025 Sandwich Press, Stainless Steel toaster is a fantastic bit of kit that we couldn’t do without, and so we highly recommended. The Giles & Posner EK2017SGMOB EK2017 sandwich maker is 31.6cm x 27.2cm x 12cm in size and made from stainless steel. It has both power and ready to cook lights in built and with its inbuilt temperature control it can cook a couple of toasties in about 4 minutes. The design of the toaster has made it possible to have thicker bread with more fillings to make your sandwich worth waiting for. The plates are non stick and easy to clean off after use and it can also double as a grill to cook on as well. The Giles & Posner EK2017SGMOB EK2017 sandwich maker is one of the more expensive options out there, but is still a reasonably good buy. The Hamilton Beach Electric Breakfast Sandwich Maker is as ingle sandwich maker 24.4cm x 18.6cm x 17.6cm in size. With this you can make your own breakfast sandwich within 5 minutes using muffins or bagels or one of many others. Add to this your selection of eggs or sausage meat or vegetables and you have a full meal all in a bun! All the cooking surfaces have a hardwearing non stick coating that can be removed and put in the dish washer to clean. The downside to this is that it only makes one sandwich at a time so may not be suitable for a large family and it is the most expensive model from our list. The Hamilton Beach Electric Breakfast Sandwich Maker is small and expensive in comparison to the other models and its limited ability to cook for more than one person at a time is a negative point, but on the other hand can make some scrumptious muffin burgers! There’s nothing nicer than a nice warm cuppa with a couple of slices of toast. Now, add to that the fact that you made the bread by hand or in your bread machine to put in the toaster and you are on a winner all round, fresh homemade bread and you know exactly what you are eating. There are many types of toasters out there, some are basic 2 or 4 slice toasters and others do things like boil eggs for you, yes really! We have left out sandwich toasters as we have covered them separately here. So, we have reviewed a few of our favourites for you to look at to make your mind up as to what is the best toaster to buy whether it’s for you, your university bound child or a wedding present that might actually be kept and used! Special Look & Lift feature to enable you to check how the toast is cooking without stopping it. Designed to fit all Warburtons bread. The Breville VTT570 2-Slice Toaster has been made so that it will toast all Warburtons sliced bread right up to the top of the slice so that you are not left with the top edge barely toasted. It can accommodate 2 slices of bread at a time and is 24.5cm x 32cm x 24.8cm in size and has a sleek shiny stainless steel casing that will fit into almost any kitchen. The variable width slots are extra wide to be able to use it with things like bagels, crumpets and homemade hand sliced bread. The buttons for the defrost, reheat, cancel functions are illuminated with red lights on the side of the toaster along with the toast browning level dial for easy access. There are other nice features like the ability check on your toast without switching it off by using the Lift & Look feature. Another handy feature is it’s extra high lift for when you are toasting small items like crumpets that don’t pop up far enough to grab without burning your fingers. Finally the toaster has non slip feet and a removable crumb tray to make cleaning it simple and easy. This is a decent toaster that ticks most of the boxes for most people. At a reasonable price it is a good buy for individuals or small families. The Morphy Richards Accents Four Slice Toaster is a cool to touch 4 slice toaster. It is 21cm x 29cm x 25cm in size with a cool wall stainless steel body with black ends. It comes with a 2 year guarantee and can accommodate 4 slices at once. The controls are all on the side and include defrost, reheat and toasting buttons, plus there is a eject button to immediately pop the toast up rather than wait for the normal timer finish. Each side has it’s own browning control dial so that you can have both well done and just toasted bread at the same time. It produces a nice even toast colour over the whole bread and to aid cleaning both sides have a removable crumb tray. The only gripe about this toaster is that the power lead is a bit short so it has to be located near to the plug socket and it could be a little taller. If you want a bigger family sized toaster that isn’t going to break the bank then this would be a ideal candidate. The Breville VTT476 Impressions 4 Slice Toaster is a smart looking satin chrome black 4 slice toaster. It is 21cm x 31cm x 34cm in size and has cool wall technology to stop you burning your hands on it. The slots are large variable slots to enable it to take a variety of slice sizes and if the object is small then the high lift feature will enable you to get them with out burning your fingers. The control buttons for the defrost, reheat and mid cycle cancelation are all illuminated to easily identified what has been selected. The bread browning is controlled by a 9 point power setting slider. There are a couple of negative points for this like the crumb tray has to be removed from the rear of the unit and it could be a little taller. The quality of the toasting is pretty good with fairly even browning over the toast. This stylish 4 slicer is available at a good price but it is a shame that the heating cannot be split between the 2 halves. However it is still a nice toaster. Wide slots for thick bread, muffins, croissants etc. The Tefal TT550015 Toast and Egg Two Slice Toaster and Egg Maker, 1200 W is 20.4cm x 22.8cm x 40cm in size and has a integrated steamer that can cook 1 poached egg in the special poached egg tray, or up to 4 boiled eggs in under 4 minutes. With its wide toast slots it is easily able to toast things like crumpets and bagels and still be able to retrieve them after they are cooked using its toast lift facility. You can also warm up pre-cooked meals on its warming tray. This model can only do eggs, but the Tefal Toast n Bean Toaster and Bean Maker TT552842 can cook beans as well. There is an adjustable browning control as well as a button that will enable you to cancel your current cycle. The toaster is just about capable of toasting a large slice of bread and manages a fairly even spread of colour over the bread though it does take a little longer to toast using this compared to other toasters . This is a great 2 slot toaster and would be ideal for a student or single person. The fact that you can only poach 1 egg at a time is why we ended up choosing the Russell Hobbs 21302 Legacy 4 Slice Toaster over this, but only just! The Russell Hobbs 21302 Legacy 4 Slice Toaster is 34cm x 30.8cm x 26.8cm in size and is made in stainless steel with cream ends embossed with the Russell Hobbs logo. There is more than a hint of traditional kitchen equipment in the design of this. However, with it’s added technology giving it up to 48% faster toasting than the Russell Hobbs Heritage Toaster (18260), it is well grounded in the 21st century. With its ‘frozen bread’ feature it can toast bread straight out of the freezer without needing to defrost it first. The slots on this are wide enough to accommodate thick sliced bread, crumpets and teacakes. The toaster can also be operated independently as either a 2 or 4 slot toaster. This is a great 4 slot toaster and would be a great addition to any kitchen with its reasonable price tag. So you’ve made your tasty bread machine made or hand made bread and because you’ve made enough or extra you still have some left over! So how are you going to store your bread? What About Keeping Bread In The Fridge? Everyone considers the refrigerator as the one stop solution for keeping extra bread. However, in reality, keeping bread in a refrigerator is totally ineffective and even redundant! This is because the refrigerator extracts the moisture from the bread, causing dryness and making it go bad three times faster. (Scientifically called ‘Retrogradation). So you should only store bread in the fridge if it is in a sealed bag or container to try to retain as much of the moisture in it as possible. So How Are You Going To Store bread? Generally, the most optimum way to extend the life of bread is to keep it well-packaged and in a room temperature, for a day or two. If it is still remaining after two days, you should consider freezing your bread and heat it up again later for that freshly baked taste. Now we shall be reviewing the steps involved in properly keeping the bread fresh for elongated periods. The steps are simple and once put in action, will prevent your bread from going bad and eventually being wasted. An air and moisture free packaging will cut any elements which harden your bread and bolster the growth of mold in it. Using a plastic or an aluminium wrap is perfect for this purpose as both of these materials are impermeable. Even if your bread comes with a paper bag, you should still opt for the plastic or aluminium wrap. If you have sliced bread which usually comes in a plastic packet, then you can keep the bread in the original packaging whilst ensuring proper sealing. However, in case your house is in an area with great humidity, you should ignore this step and go on to the next one. This is because the high humidity promotes growth of mould under room temperature. If you are sure that you will not be able to finish your bread within the next one or two days, then it is wise to freeze it up. Freezing prevents the starch in the bread from maturing and staling the bread. While freezing, ensure that the plastic / aluminium bag is freezer friendly, otherwise the bag may break under the cold temperature. Label the date of storage on the bag. Slice the bread before freezing, if possible. This will help in thawing and heating. On the off chance that you have frozen your bread, permit it to defrost at room temperature. Remove the plastic or aluminium wrapping and allow the bread to stay in room condition. In the event that you’d like, fresh and crisp bread, put it in the toaster for a couple of minutes (close to 5 minutes) to re-establish the texture. Remember though that bread is useful for crisping only once, after which you are just warming stale bread! Avoid putting warm bread in a wrap. The steam makes the bread surface wet and aggravates mould growth. Do not put fresh bread inside a wrap. Avoid slicing fresh bread. Allow it to rest and cool down. Type of bread and the ingredients use affects its aging. Be realistic. Old bread will not be 100% the taste quality as that of a fresh bread. Making your own bread is satisfying, tasty, and better for you (than most shop bought bread.) But, take a look on Amazon or another online retailer to buy a bread maker, and what do you see? A huge range of machines to choose from – which is good – but how do you know which one to buy? With that in mind, I have created this list of questions and answers about bread machines. I will add to it as and when I get asked more questions, or think of them myself. I hope it helps. This is definitely the most important question to ask. If you are investing in a bread machine, both financially and time wise, it is worth making sure you are getting a good one. Trust me, there is nothing more frustrating then buying ingredients, putting them in the bread machine, waiting 3 odd hours for the bread to be made, only to discover it comes out inedible! I’ve been there and bought that bread machine! Once upon a time, I bought the cheapest bread machine for sale, without reading any reviews or even doing any research. Big mistake. Occassionally I would get a winning loaf, but more often than not, it would produce a flat and dissapointing lump of bread. a) Read my best bread maker guide to help start you off with your research. b)Decide how often and what kinds of bread you want to be making. Do you want to make gluten free? Raisin bread? Quick bake? c) Work out your budget – how much can you afford to spend? 2. How much does a bread maker cost? The cost of a bread machine varies quite wildly. I think it is true to a certain extent that you get what you pay for, but, that doesn’t meant that you have to go for the most expensive model out there. At the time of writing this, the cheapest bread maker for sale on Amazon is the Russell Hobbs 18036, and it is a good machine. Read my full review of this bread maker. You’ll be quite pleasantly surprised. On the same day, one of the more expensive bread makers on Amazon, is the Panasonic SD2502 Stainless Steel model. Yes, it does cost quite a bit. But, visually it is very modern and sleek. On performance, it scores top marks. I have done my research on this dream model. Check it out if you’re tempted! 3. How economical is a bread maker? You need to know how much making your own bread is going to cost you. Once you’ve made your mind up about which bread maker you want you can factor in the running costs. We will one day soon actually keep a tab of how much it costs us to make our own bread in a bread maker, as opposed to buying from the supermarket. At the moment we do a mixture of both shop bought and homemade. We are a family of 5 and we get through a lot of bread. In anticipation of this question, I done a little bit of my own research on the net. There is a useful article here and here. My own personal opinion/guess is that I think we do save money as we are a large family and we eat a lot of bread. 4. How hot does a bread maker get? Most breadmakers have insulated outer walls, meaning that the outer surface doesn’t get too hot during baking. They will be warm to the touch though so do double check for yourself before you leave it out near small children. 5. Is a bread machine noisy? Some bread makers are noisier than others. But, I don’t think they are ever noisy enough to cause a problem. It is only when they are in their mixing and kneading phase that you can hear it. Assuming that it will only bother you at night time, I really don’t think it would be enough to wake you up, unless you sleep very close to the kitchen or your are a very light sleeper! 6. What yeast should I use and where can I buy it? Firstly, make sure that you get yeast that is meant for bread makers. We have used a variety of brands, including supermarket own. We prefer to buy the ones that come in sachets, as the yeast can remain fresh for longer. Our favourite one to use so far is Allinsons Easy Bake Yeast . You can buy larger quantities direct from Amazon and save some money on supermarket prices. 7. I’m allergic to grains – can I make bread without using wheat flour? Yes it is possible to make bread without Wheat flour there are many different types of bread that you can make with your bread maker like Gluten free bread. 8. What happens if there is a power cut when my bread maker is running? Some bread makers have an automatic feature that will continue the baking process in the event of a short power interruption. For example the Russell Hobbs 18036 Bread maker has a automatic timer in case of a short power outage of up to 7 minutes. However, if the outage any longer then the baking process will not be able to be continued. Not all bread makers have a function like this built into them, so if your electricity supply is unreliable then this might be a handy feature to look for. Another bread maker with a similar function in built is the Panasonic SD2502 Stainless Steel bread maker. 9. The paddle (mixer) keeps on getting stuck in my loaf of bread – how can I get it out without it ruining my bread? Unfortunately after continued use your paddle could start to become loose and get stuck in the loaf when it bakes. If this happens the only way to get it out is to cut it out of the bread. Just be careful if you are using a electric powered knife in case it catches the paddle. You might be able to try to buy a new paddle from the suppliers which should make it less lightly to come off and stick to the bread. 10. Will using the rapid setting on my bread maker reduce the quality of the bread it produces? Yeast grows at 27 degrees and produces carbon dioxide as it grows. If the dough is softer it will rise more easily. Salt in fact kills yeast, so less salt means more growth. Fast baking methods can provide good quality bread though they might be slightly smaller due to the shorter rising times. The bread maker recipes can of course be adjusted slightly. 11. Where can I get bread maker recipes from? 12. Should I use butter or oil in my bread? For most recipes you can use either butter, margarine or oil. This not only helps to flavour the bread but also helps to stop it from sticking when it is baked. It is a good idea though if possible try to have it at room temperature when you add it to the machine as the yeast wont rise as well with a colder mixture. 13. What quality flour and yeast should I use? Most bread makers recommend using Fast yeast or a form of Quick yeast because it doesn’t need to be soaked before using. The type of Flour that should be used is Strong Flour. The main difference with strong flour compared to normal plain flour is the high Gluten content which aids in the retention of the gases produced by the fermentation process of the yeast and that in turn produces a good structure to the bread. So the better the quality of yeast and flour, the better the result. 14. How long does the bread stay fresh for? The main advantage of a breadmaker is that it gives you the opportunity to get fresh bread without any preservatives every day and the only ingredients in it are the ones that you add. However, as a result of this the shelf life of your home baked loaf will be considerably less than that of your average shop bought bread. A lot depends on how you store the bread, e.g. in a breadbin or just out on a breadboard. You could even try adding some natural preservatives like vinegar or garlic, but this will effect the taste of the loaf. It is probably best to aim to store it for no more than 48 hours after cooking. 15. Can I make bread rolls in a bread machine? Yes, with most bread makers it is possible to just make the dough which you then take out rise and cook in an oven. Some of the bread makers will come with recipes books that might include bread roll dough mixture, but if not then there are plenty of places on the internet to find bread maker recipes. 16. What size loaves can I make? This really depends on the bread maker. As a general rule most bread makers can make about 3 loaf sizes between 1lb & 2.2lbs. 17. Can you make a pizza base in a bread maker? Once again, it is possible for most bread machines to make pizza dough. Most have setting that will allow it to make the pizza base dough and all you need to do is roll it out and add the toppings and stick it in the oven! 18. How do I measure out the ingredients? Generally most bread makers will come with some basic measurement device. They can have bread maker recipes which need to be measured out on scales but another common method is teaspoon, table spoon & cup measurements which are normally supplied with the bread machine. 19. Can I make cakes in a bread machine? Yes you can. In fact, you can make sweet breads and cakes. We love making raisin bread in our bread machine and adding a little cinnamon. This is a delicious bread to make at Christmas time. 20. I don’t like to use salt in my cooking – do I need to put it in my bread? I don’t either. I always add half the amount of salt recommended in the recipe. I have never tried it without salt altogether but I don’t think it would make a difference. If you are worried about the salt content in home made bread I wouldn’t, the amount added is miniscule when you compare it to the loaves sold in the supermarkets. 21. Will I get a warranty when I buy a bread maker? Always check in the product description but most electrical appliances should come with at least a 12 month warranty from the manufacturer. Some shops might try to tempt you to pay for an extra warranty – this article by MSE is interesting and explains the situation thoroughly. 22. Can I make jam in my bread machine? Yes you can! Who would have thought a bread maker could be so versatile?! You just have to add the fruit of your choice (blackberries taste yummy!) and add some sugar (quite a bit!) I will be adding some jam recipes to the website very soon. There should be a jam setting on your machine – I know there is on the Panasonic. 23. Where can I get spare parts for my bread maker? There are a few places you can source spare parts from. You can check on Amazon or if you are in the UK, espares are a good place to start, and e-bay. Finally, you can course directly with the manufacturer. 24. What is the best bread maker for making gluten free bread? I would go for either of the Panasonic models. Read our article here on gluten free bread machines. 25. How can I make croissants in a bread maker? We LOVE croissants in this house. Recipe coming very soon. For now – check out this one. 26. How can I make hot cross buns in a bread maker? Ditto with the hot cross buns. It doesn’t have to be Easter to scoff them either 🙂 Again, once I have our recipe section up and running I will add our hot cross bun recipe. For now – go here. 27. What is the best budget bread maker? Do remember that you get what you pay for – but, having said that, we have bought cheaper bread machines before and they have lasted a while. It depends if you are after daily use or not. If I was looking for a budget yet still great quality machine I would opt for the Morphy Richards Fastbake. 28. What is the best bread maker for large families? I don’t think you can go wrong with a Panasonic bread maker. You can choose from 3 different loaves and have a gluten free option should someone in your family have an intolerance. 29. How do I get the bread out of the bread maker? The container you cook the bread in will be very hot. Make sure you use oven gloves to prevent any burns. If you are home it is best to remove the bread from the pan as soon as you can. Put the bread on a cooling rack – this allows the bread to cool whilst letting the water molecules to evaporate. No more soggy bread! It also makes it much easier to slice your bread with a bread knife or electric slicer. Read my bread slicer guide for recommendations for the best one to use. 30. What is the best bread slicer to use to cut my bread? It’s no good making a delicious loaf and then you make a mess of slicing it. Read my bread slicing guide here.